This beautiful 2,685 square foot, all brick home is located in the McKay's Mill subdivision in Franklin, Tennessee. Stately in appearance, its elegant exterior and neat landscaping create a clean and welcoming first impression. This property is the largest in the neighborhood, and a fenced-in backyard provides plenty of privacy. It also offers a two-car garage and stylish, partially covered deck. The home hosts three bedrooms, two and a half bathrooms, gorgeous hardwood flooring, and plenty of cozy living spaces. 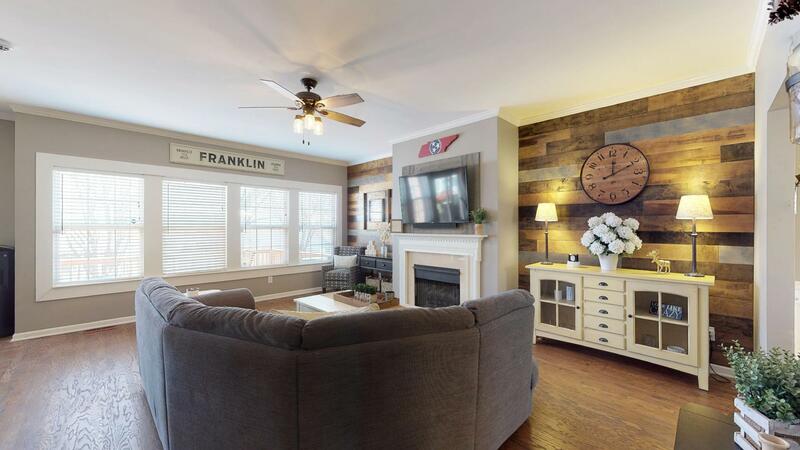 With such homey, comfortable amenities, this home is a distinguished take on southern living. Two large front windows shed light on the sophisticated, chic dining room. A neutral wall tone meets a clean white base, creating a perfect outline for this elegant space. A contemporary light fixture hangs in the center of the room, highlighting the gorgeous hardwood flooring below. The size of the room creates the perfect setting for either a large dinner party or intimate family gathering. This room is sure to impress many dinner guests. The kitchen area is a prime example of simplicity at its finest. Beautiful white cabinets stand out against an earthy wall tone. A pristine, white backsplash provides a lovely backdrop for the granite countertops. 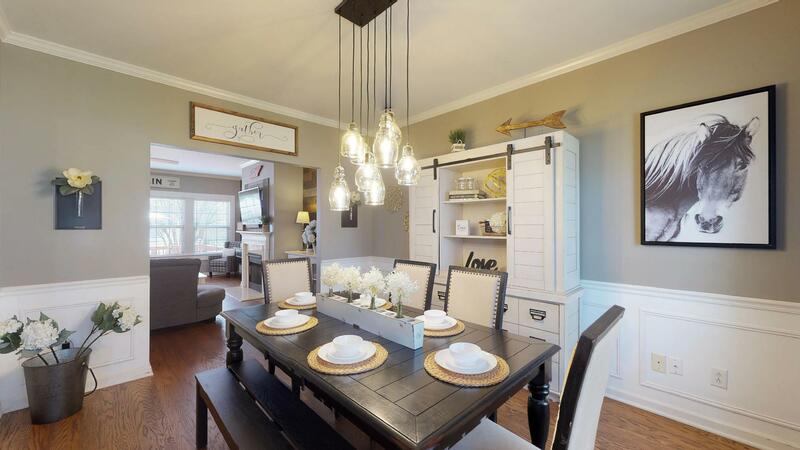 Hanging light fixtures establish a trendy flare to a homey environment. An electric oven and cooktop range, microwave, disposal, and dishwasher create a functional, enjoyable space for meal preparations. As you enter the inviting living room, the eye is immediately drawn to the rustic accent wall. The blend of natural colors offers a charming quality to the space. The fireplace, seated in the center of the accent wall, establishes a welcoming character, so fitting for a room meant to entertain. Hardwood floors and a beautiful view of the outdoors set up this living room for a lovely, relaxing afternoon at home. This dreamy take on a master bedroom provides room enough for complete comfortability. It is even outfitted with a large walk-in-closet for plenty of storage space. Light carpeting and a light wall color frame the enlarged space with an open, airy atmosphere. This master retreat also includes a master bathroom, complete with dual vanities and a separate shower and bathtub. 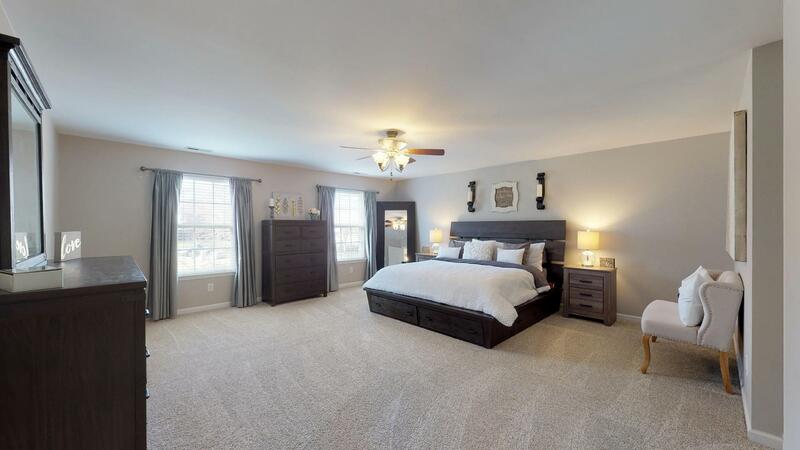 You might catch yourself daydreaming about coming home to this inviting master suite. Q: What do you love about your current home? A: The neighborhood! Wonderful families we have made lifelong friends with; The house itself is on a corner lot with an extra large backyard; Easy to maintain; Bonus room is a huge plus for guests or separate space for the kiddos; Quiet, safe, restaurants, salons, grocery stores, best schools in the state all conveniently located! Q: What drew you to your current home originally? A: We first looked at top elementary schools and Clovercroft was at the top of the list in the state. Then, we quickly realized that the pool was a few short steps away. The neighborhood had families outside and gave us a great sense of community. Q: Where do you love to eat? A: Jets pizza is a must! Buffalo Wild Wings, Chuy’s, & PF Chang’s; For a good burger, try Ground! Q: Where do you love to shop? A: TJ Maxx, Target, Costco, Galleria Mall- all located within a 5 mile radius. Q: What can you tell me about your neighborhood? A: Safe, families with kids from ages 3-14; no soliciting; Stone's throw from clubhouse, fitness center, and Olympic-sized pool! Q: Is there anything else you would like to add about the schools or the area where you live? A: Williamson county has the top rated elementary, junior high and high schools in the state/country! Q: What drew you to the town? A: Has one of the best reputations. The location is top notch! Wonderful sense of community. 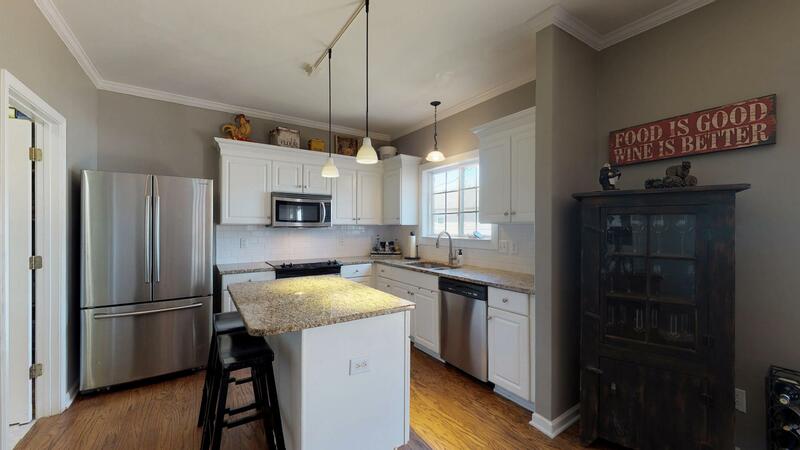 Local grocery, salons, restaurants, private pre-schools/daycare, crime rate is almost null, fire station around the corner, close to I65, malls, theaters, and Nashville is under 20 miles away! Students who live at 1002 John Clark Court can attend Clovercroft Elementary School, Page Middle School, and Centennial High School. These schools are located in the Williamson County School District. For children under the standard school age, daycare options include: Franklin Child Care, Cadence Academy Preschool, and many others. For adults looking to take their education to the next level, there are plenty of universities to choose from near home. Lipscomb University and Belmont University are two of the most notable options. There are actually 18 schools within a 20 mile drive of the city. Franklin has a lot to offer its residents, including education opportunities for all. If you are looking for that perfect home or looking to sell that special home, call Holloway Home Group agent Erin Holloway at 615-939-4085 or email hollowayhomegroup@gmail.com. 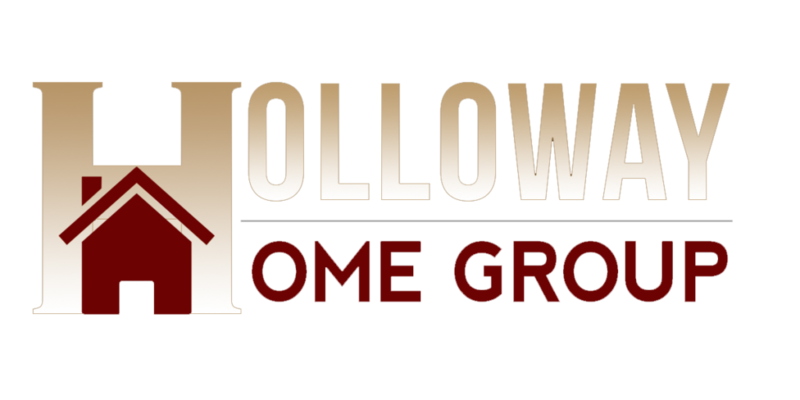 Holloway Home Group can also help you buy another house or determine your home’s value. Don’t wait – call us today: (615) 778-1818. For more updates on new listings or real estate activity, follow us on Instagram!